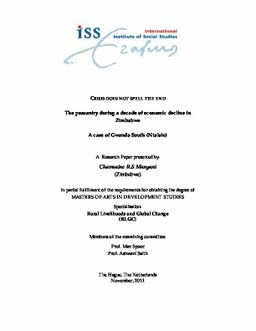 Crisis is not the end, as shall be demonstrated in this paper presenting the case of Ntalale village situated in Gwanda, Matabeleland South in Zimbabwe. The economic decline witnessed in Zimbabwe in the last decade has reshaped the livelihood strategies of people in both the urban and rural areas. This paper seeks to highlight and explain how the peasant farming households in Ntalale have had to reorganize their lifestyles by engaging more in diversified income portfolios as coping strategies in the climate of macroeconomic decline. Trends of de-agrarianisation in the area shall be explored with emphasis placed on the empirical evidence that this phenomena has not only been the result of the economic collapse but that there are other contributing factors leading to this situation. Venturing into the different income making strategies has created a visible differentiated class of people in the village and this has had a bearing on social relations in the area. This paper shall therefore also explore how these relations have been reshaped and how they have reconstituted the social relations in the area. Conclusions drawn from this paper reveal that though the economic decline and harsh climatic conditions have resulted in diversified livelihood portfolios and de-agrarianisation in the area this has not led to the ‘inevitable’ demise of the peasantry.